DALLAS — Research from Parks Associates finds 16% of U.S. broadband households admit to sharing their passwords for their video service accounts with other people. Innovations in Authentication and Personalization Technologies reports that service providers will have a difficult time moving subscribers to new methods of password-free authentication. 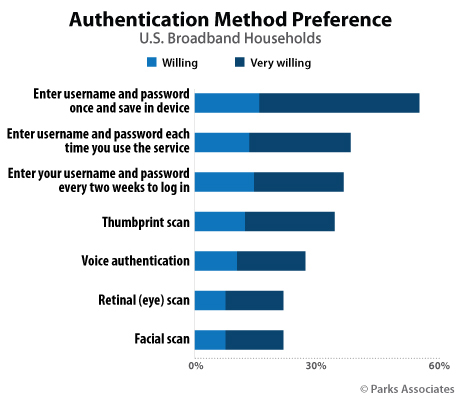 Only one-third or fewer of U.S. broadband households are willing to use a non-password authentication method such as voice or thumbprint, while 54% of U.S. broadband households are willing or very willing to enter a username and password once and save it on a device.